The historic stone tower in Ypsilanti, MI is not only an area landmark, but holds a place of quirky distinction and local pride. It borders both Eastern Michigan University where I went to art school, and the Normal Park neighborhood where I live. This candle is offered in celebration of our beloved water tower – uniquely Ypsilanti. The tower was designed by William R. Coats and completed in 1890. It sits atop the highest point in Ypsilanti. Made of Joliet limestone, the tower is almost 150 feet tall. For more information about Ypsilanti’s historic stone tower, visit YCUA. My Ypsilanti Water Tower Candle is 8.5” tall, and is made of a 50/50 blend of soy and paraffin wax. All candles are unscented. They are made using a 2-part silicone glove mold & plaster mold combination (see images below). Prices include free USPS Standard Shipping within the U.S. Please contact me for local pick-up or other shipping methods. The wait for the final season of Game of Thrones is long. To fill in time I made my first piece of fan art. The Many-Faced candle is a 5 sided design with 15 different faces. 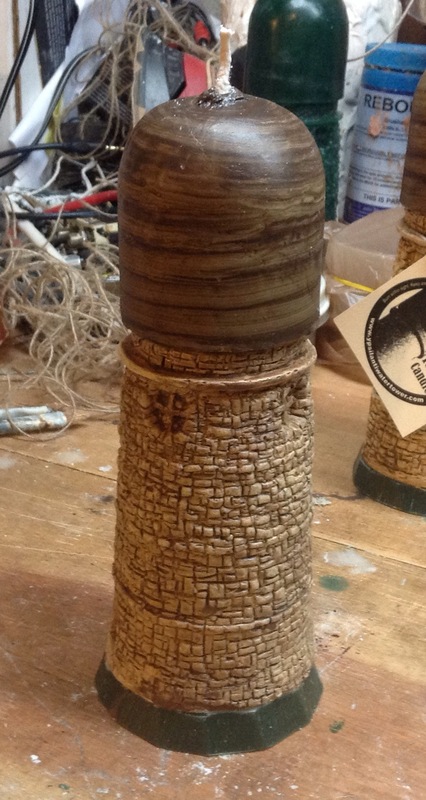 It stands about 7.5″ tall and is a soy blend wax. The indented top gives good light transfer to the surface when lit, and also allows for the wick to be flattened to hold an electric tea light. It was made by creating the original then producing a silicone glove mold and plaster shell. Candles are cast at a rate of about one per day. Off white, unscented. A prominent landmark and symbol of the University if Michigan in Ann Arbor, Mi, the Burton Memorial Tower and Baird Grand Carillon is commonly known as the Bell Tower. Rendered here as a hand made soy-blend candle. The Bell Tower Candle stands 10.5″ tall. I have many great memories of the tower from rallys and protests on the U of M diag, to a personal tour and concert played on the amazing carillon bells. Because of the unique shape of this candle, dripping may occur. Always place in a heat-safe plate or dish when burning. Burn time aprox 30 hours. Leading up to this I’ve created the original model, made a silicone glove mold and an outer shell. A simple armature and clay are given form and detail. The finished model that molds will be made from. A 2-part silicone mix is applied in 4 coats to capture detail. With a plaster outer shell providing support. Now turned upside down with a wick running through. A familiar form emerges as the silicone glove mold is pealed back. From layers of plaster and silicone comes a candle. Things don’t always go as planned, and mistakes are made. But even the mistakes get another chance at candle stardom.